고려 후기의 승려인 보제존자의 사리탑으로, 모두 2기이다. 1915년, 일본인에 의해 국립중앙박물관으로 옮겨 세워졌는데, 보통 승려의 사리탑과는 달리 석탑 형식을 취하고 있다. 보제존자(1320∼1376)는 여주 신륵사에서 입적한 나옹화상으로, 신륵사에 그의 사리탑이 남아 있으나 제자들에 의해 영전사에도 따로 사리탑을 세운 것이다. 2단의 기단(基壇) 위에 3층의 탑신(塔身)을 올린 모습이다. 기단은 위·아래층 모두 모서리에 기둥조각을 새겼고, 위층 기단 윗면에는 탑신을 받치기 위한 돌을 따로 끼웠다. 탑신은 몸돌과 지붕돌이 각각 하나의 돌로 이루어져 있으며, 몸돌에는 모서리마다 기둥조각이 있다. 지붕돌은 밑면의 받침이 4단씩이다. 2기 가운데 1기의 1층 지붕돌은 양식상 차이가 있어 원래 이 탑에 속하였던 것인지 의심스럽다. 탑의 꼭대기에 있는 머리장식은 2기 모두 완전하게 남아있지는 않다. 고려 우왕 14년(1388)에 세운 것으로, 승려의 묘탑으로서는 매우 이례적이며, 더욱이 거의 같은 양식으로 2기를 건립하였다는 점도 특이한 예이다. 탑을 지금의 자리로 옮길 당시에 각각의 탑에서 사리를 두는 장치가 발견되었는데, 그 중 한 탑에서는 죽은사람에 관해 새긴 지석(誌石)이 발견되어 이 탑을 세우게 된 과정을 알 수 있게 되었다. 이 탑은 전체적으로 짜임새가 훌륭하고 균형을 이루고 있다. 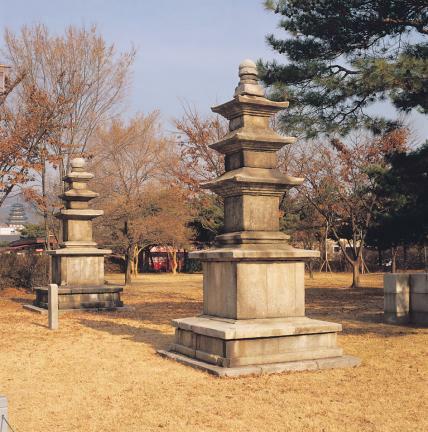 These two Stupas of the Buddhist Monk Boje were built in the 14th year of the reign of King U of Goryeo (1388). 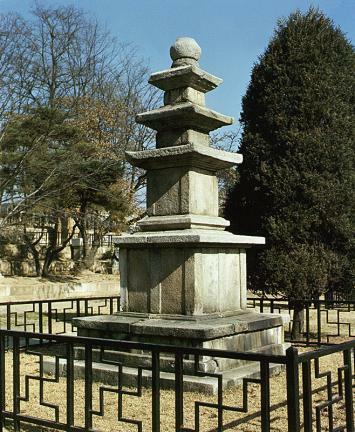 Boje (1320-1376) is also known by his Buddhist name Naong who entered Nirvana in Silleuksa Temple, Yeoju. 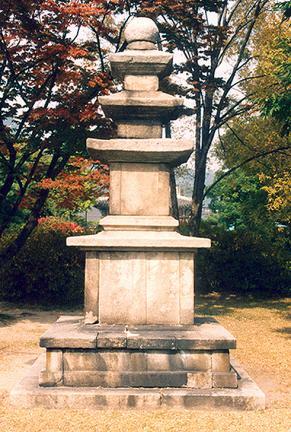 His stupa still remains in Silleuksa Temple, but his students built another one for him in Yeongjeonsa Temple. In 1915, the Japanese moved it to its present location in the National Museum of Korea. It is very different from the usual stupa in that it takes the form of stone pagoda, a three-story pagoda standing on a two-story stylobate. Pillar-shaped patterns are engraved on upper and lower stylobates at the edge. On the upper stylobate lies a stone that supports the body of the stupa. The main stone and the roof stone of the body of the stupa are each made of a single stone. A pillar-shaped pattern is engraved on each edge of the main stone. 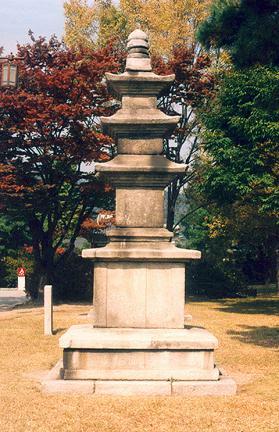 The roof stone has a four-tiered base. The roof stone of the first floor of one stupa of two shows a different style from others, and it is doubtful whether it originally belonged to this stupa. The ornamentation on top of the pagodas has not remained in perfect condition but it is an exceptional stupa, and it is unique that two stupas were built in almost the same style. While they were being moved to the present location, the sarira relinquary was found within the pagodas. 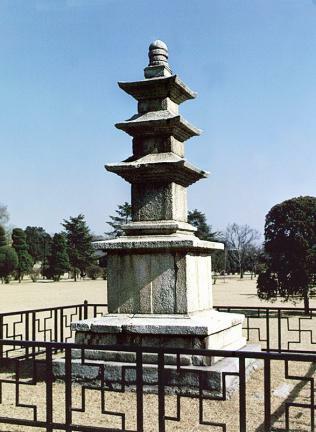 The history of the erection of this stupa was known from a memorial stone found in one of the pagodas. Overall, it is very well assembled and balanced.